Expedition is siring some incredibly stout and high performing progeny. Use him to add frame size. He has 5 stars for Tenderness and Feed Efficiency. He ultrasounded a 19.2 REA, and his dam posts ratios of 105 for WW, 105 for YW & has 5 progeny scanned with a 127 IMF ratio & 107 RE ratio. 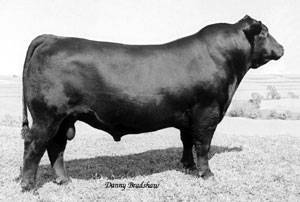 He sired the 2007 NAJS Champion Carcass Steer. With his Feed Efficiency, he saves 3.26 pounds of feed per day.